Alainn and Killian fight to keep their loving, passionate relationship alive. But as Alainn delves deeper into her magical abilities, she uncovers a demon, a coven of wrathful witches, and a past lover...all intent on keeping her and Killian apart. 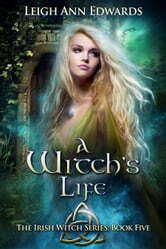 A Witch's Life is set in sixteenth century Ireland, an undoubtedly enticing and mystical time and place, yet wrought with misfortune and upheaval. In this fascinating tale of undying love and enchanting fantasy, Alainn and Killian encounter numerous benevolent spirits and vengeful, dark supernatural entities. Couldn’t put it down,if you like fantasy/romance you’ll love it too.